"SVT" redirects here. For other uses, see SVT (disambiguation). Sveriges Television AB (SVT, Swedish pronunciation: [ˈsværjɛs tɛlɛvɪˈɧuːn] ( listen)), Sweden's Television, is the Swedish national public television broadcaster, funded by a public service tax on personal income set by the Riksdag. Prior to 2019, SVT was funded by a television licence fee payable by all owners of television sets. The Swedish public broadcasting system is largely modeled after the system used in the United Kingdom, and Sveriges Television shares many traits with its British counterpart, the BBC. SVT maintained a monopoly in domestic terrestrial broadcasting from the start in 1956 until the privately held TV4 started broadcasting terrestrially in 1992. It is barred from accepting advertisements except in the case of sponsors for sporting events. Until the launch of the Swedish language satellite television channel TV3 in 1987, Sveriges Television provided the only Swedish television available to the public. SVT is still the biggest TV network in Sweden, with an audience share of 36.4 percent. When radio broadcasting was organized in the 1920s, it was decided to adopt a model similar to the one of the British Broadcasting Company in the United Kingdom. The radio would be a monopoly funded by a license fee and organized as a limited company, AB Radiotjänst ("Radio Service Ltd."), owned by the radio industry and the press. The transmitters were owned by the state through Telegrafverket and the press held a monopoly on newscasts through Tidningarnas Telegrambyrå. AB Radiotjänst was one of 23 founding broadcasting organizations of the European Broadcasting Union in 1950. Tidningarnas Telegrambyrå lost its monopoly on newscasts de jure in 1947 and de facto in 1956, but otherwise the same model would be applied to television. It was decided to start test transmissions of television in June 1954. The first transmissions were made on 29 October 1954 from the Royal Institute of Technology in Stockholm. In 1956, the Riksdag made the decision to permanent television broadcasting. Transmissions were officially started in Sweden by Radiotjänst on 4 September the same year using the new Nacka transmitter. A television license for those owning a television set was introduced in October. Television started broadcasting regularly in 1957. At the same time, Radiotjänst was renamed Sveriges Radio (SR) and its ownership changed. The state and the press would have equaled 40% shares, while the company would own 20% (in 1967, the state increased its share to 60% at the expense of the press). In 1958, the first newscast, Aktuellt, was broadcast. During the 1960s a second TV channel was frequently discussed. The discussions resulted in the start of TV2 on 5 December 1969. The first channel was named TV1 and the two channels were supposed to broadcast in "stimulating competition" within the same company. The first stage of the main headquarters building and TV studios for Sveriges Television, called TV-huset (sv), was inaugurated on Oxenstiernsgatan in the Östermalm district in Stockholm on 30 October 1967. The completion of the second stage of TV-huset and its official opening was on 5 December 1969, the same day as the start of operations of TV2, making it one the largest television studios in Europe at that time. 1970 saw the start of the first regional programme, Sydnytt from Malmö. More regional news programmes launched in 1972 and the entire country was covered by regional news programmes by 1987 when ABC from Stockholm started. When TV2 started the news programmes were reorganized. Aktuellt was cut and replaced with TV-nytt, which was in charge of the main 19:30 bulletin on TV1 as well as news updates on both channels. In addition, the two channels would get one "commenting bulletin" each. TV2 got Rapport and TV1 got Nu. In 1972, the news was reorganized once again. Rapport was moved to the 7:30 slot on TV2, Aktuellt was revived and would broadcast at 6 and 9 on TV1. Those timeslots would mostly stay unchanged for the following decades. In 1966, the first colour broadcast was made, with regular colour broadcasts being introduced in 1970. Teletext started in 1978. At the end of the 1970s, SR was reorganized. From 1 July 1979, Sveriges Radio AB became the mother of four companies: Sveriges Riksradio (RR) for national radio, Sveriges Lokalradio AB (LRAB) for local radio, Sveriges Utbildningsradio (UR) for educational broadcasting and Sveriges Television (SVT) for television. SVT would provide all television broadcasting, except for educational programming which was the responsibility of Sveriges Utbildningsradio. 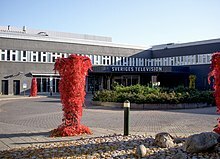 The abbreviation SVT was chosen over the arguably more logical "STV" as that abbreviation was already occupied by Scottish Television in the EBU. The Swedish EBU membership is currently jointly held by SVT, SR and UR. The two channels were reorganized in 1987. TV1 was renamed Kanal 1 and contained almost all programmes produced in Stockholm, while TV2 consisted of the ten regional districts and the Rapport news desk. Broadcasts in Nicam Stereo were made permanent in 1988. This year also saw the launch of a channel called SVT World in southern Finland, broadcasting content from SVT for Finland-Swedes. The channel, which was later renamed SVT4, was rebranded as SVT Europa in 1997, when it started broadcasting to all of Europe through satellite. Following its expansion into Asia and Africa, it was rebranded as SVT World in 2005. In 1992, the Riksdag decided that Sveriges Radio would reorganize once again into three independent companies (with RR and LRAB merged). From 1994, they would be owned by three independent foundations. The three foundations would later change into one foundation. In 1990, broadcasts would usually start at 16:00 and finish before 00:00. The 1990s saw an increase in broadcasting time with reruns in the afternoon, a morning show and lunch-time news bulletins. SVT also met competition from the young commercial broadcasters. TV3 became the first channel to break SVT's monopoly on television in Sweden and in 1992, the newly elected right-wing parliamentary majority allowed TV4 to start terrestrial broadcasts. They soon established nationwide coverage and in 1995, TV4 passed TV2 in the overall ratings and became the nation's most viewed channel. In 1996, the channels were once again reorganized. The previous organization and competition between the two channels disappeared as they became part of a single organization. Kanal 1 and TV2 were renamed SVT1 and SVT2. The first season of Expedition: Robinson (Survivor) was shown in 1997. The first digital terrestrial television-broadcasts (DTT) took place in 1999. SVT started six new channels, the news channel SVT24 and five regional channels. 2000 saw the reorganization of the news desks. Aktuellt, Rapport and SVT24 were merged into one central news desk. In 2001 a new logo and new programme schedules, among other things, were introduced. This made SVT1 the broader mainstream channel with higher ratings and SVT2 the narrower channel. The main news bulletins at 19:30 and 21:00 switched channels with Aktuellt, now shown on SVT2, and Rapport, on SVT1. The regional channels were shut down in the beginning of 2002 and were replaced by SVT Extra. In December 2002, a new channel known as Barnkanalen began showing children's programmes during the day. On 24 February 2003 SVT24 and SVT Extra were renamed 24, a theme channel for news and sports. Also in 2003, all the SVT channels dropped their encryption in the DTT network. On 25 June 2003, SVT broadcast their first programme with 5.1 sound on DTT. The first 5.1-show was Allsång på Skansen. In November 2004, SVT added two audio streams that read the translation subtitles on SVT1 and SVT2. The knowledge-oriented channel Kunskapskanalen started broadcasting in September 2004. The shutdown of analogue transmitters started in 2005 on Gotland. By 2007 all analogue transmissions from SVT had ceased. SVT started VODcasting some programs in February 2006. Altogether three broadcasters competed to be the first one to VODcast in Sweden. In the end, all three started in the same week. SVT made their first broadcasts in high definition television during the 2006 FIFA World Cup in a channel operated in co-operation with TV4 AB. Regular high definition broadcasting started in the SVT HD channel 22 October 2006. The first programme was the movie Lost in Translation, followed the next day by the 50th anniversary tribute to television in Sweden, which was the first live entertainment programme to be broadcast in high definition in Sweden. On 25 August 2008, a new set of logos were introduced on the network with Barnkanalen renamed to SVTB, 24 renamed back to SVT24 and SVT1 has carried Regionala Nyheter for the first time. SVT was the host broadcaster of the 1975, 1985, 1992, 2000, 2013 and 2016 Eurovision Song Contests. In 2018, the Riksdag voted to replace the traditional TV licensing system with a new public service fee based on taxation of personal income. News programmes are an important part of SVT. Since 1972 there have been two main news programmes: Rapport and Aktuellt (translated "Report" and "Current [events]", respectively). The two news programmes had completely separate organizations, meaning a lot of duplicated coverage was provided. After some co-operation in the 1990s, the two programmes were allowed to merge in 2000 with the newly created SVT24 to form a single organization. The different programme names and identities were kept, however. Eventually, Rapport has become the main news programme, and Aktuellt will only broadcast one bulletin per day from autumn 2007. The main national news bulletins are Rapport at 18:00 and 19:30 CET and the more in-depth Aktuellt at 21:00. Additionally, news bulletins are shown in the mornings and throughout the day on SVT1, SVT2, and SVT24. These use the 'SVT Nyheter' brand. SVT also broadcast video news on the Internet through a service called Play Rapport. SVT provides news programs in various minority languages: Uutiset in Finnish, Nyhetstecken in Swedish Sign Language, and, in co-operation with NRK and Yle, Ođđasat in Northern Sami, and special editions of Sverige idag in Meänkieli and Romani. In 1999, 33 percent of the journalists on SVT and SR supported the Left Party, which was about the same as journalists in commercial broadcasting and print media, but significantly more than among the general public, among whom 15 percent supported the Left Party. Support for the Left Party, the Green Party and the Liberal Party was stronger among journalists on SVT and SR than the general public, while the Moderate Party, the Social Democrats and the Christian Democrats had significantly less support among SVT and SR journalists than the public. However, the study concluded that the private political opinions of the journalists had little impact on their work and that news stories are treated the same regardless of the political color of the journalist, worth mentioning as well is that SJF, the organisation in which the study was conducted partly is a unionbased organisation which could skew the accuracy of the representation within the selection (lessening the validity of the survey) as it is possible it excludes some rightwing journalists. The University of Gothenburg also made another study during the Swedish 2006 general election, comparing SVT's news programme Rapport to the country's five largest newspapers. The study concluded that Rapport's coverage of the election was the most balanced of them all. Entertainment shows on Fridays and Saturdays are, together with popular sports, the programmes that attract the largest audiences. Melodifestivalen (1959-), the preselection for the Eurovision Song Contest, is very popular in Sweden. The final generally gets around 4 million viewers. Expedition Robinson (1997–2004, 2009–2012), the original Swedish version of Survivor. Sveriges Television was the first network to broadcast this reality television series in 1997. The show, with a name alluding to Robinson Crusoe, was a major hit in Sweden. The show which consistently held high ratings was concluded after its seventh and final year on the network (the final season aired 2003-2004). The popular series was continued on the commercial channel TV3, but with much lower ratings. Expedition Robinson was aired in 2009 with a brand new season, but the series is/was just called "Robinson", and now on the commercial channel TV4. På spåret (1987–present), popular entertainment show in which celebrities answer questions related to different locations. A cut down film in extremely high speed of a train journey towards the location is shown and the sooner the contestants stop it the higher the points. In later years even car journeys has been filmed that way. Humouristic and well hidden clues are given verbally during the journey. The name of the show means "on the track" in English. The show is one of very few Swedish original ideas. It has been syndicated in other countries as well. Så ska det låta (1997–present), the Swedish adaptation of The Lyrics Board which has on several occasions reached more than 3 million viewers. Allsång på Skansen (1979–present) Broadcast live from Skansen in Stockholm, this popular summer show features sing-alongs with Swedish folk music. The first sing-along at Skansen was held in 1935. Radio transmissions of the event started shortly after that. The sing-along at Skansen has been a tradition every summer since then. Antikrundan (1989-), the Swedish version of Antiques Roadshow which has often attracted approximately 2 million viewers. Sveriges Television hosted the Eurovision Song Contest 1985, 1992, 2000, 2013, and 2016, and also as a part of Sveriges Radio hosted the 1975 contest. SVT produces drama in several genres and forms. Rederiet (1992–2002) was one of the most popular soap operas in Sweden. Regional content is almost solely restricted to news which is broadcast several times every weekday on SVT1 and SVT2. The eighteen news programmes are: ABC, Blekingenytt, GävleDala, Hallandsnytt, Jämtlandsnytt, Jönköpingsnytt, Mittnytt, Nordnytt, Smålandsnytt, Sydnytt, Tvärsnytt, Uppland, Värmlandsnytt, Västerbottensnytt, Västmanlandsnytt, Västnytt and Östnytt. The main regional news bulletins are broadcast at 18.30 weeknights and last for up to 13 minutes long. There is an additional regional news bulletin at the end of SVT2's Aktuellt. Regional news does not air on Saturdays. Kalles klätterträd ran on Sveriges Television starting in 1975 and grew to become one of the most popular children's programs of the 1970s. The children's strand Bolibompa broadcast every day at 18:00 on SVT1, before moving to SVTB in August 2008. SVT also airs foreign programming, primarily from the United States, United Kingdom and other Nordic countries, in their original audio with Swedish subtitles, as is the case on other Nordic television channels. The only cases in which dubbing is widespread is in programming aimed directly at children who are not expected to have learned reading skills yet. However for some programmes, viewers may also access 'talking subtitles' through their remote where someone reads the subtitles to viewers (though 'talking subtitles' are not strictly in sync with the original audio as dubbing is). These same practices are also done for segments of local programmes that contain foreign language dialogue. 33% of the national first-time broadcasts consisted of foreign content in 2005. Of all acquired programming (including Swedish programming not produced by SVT) 27% came from the United States, 22% from the United Kingdom, 13% from Sweden, 13% from the other Nordic countries, 6% from France, 4% from Germany and 9% from the rest of Europe. SVT often cooperates with the other Nordic public broadcasters via Nordvision. Thus, many Danish, Norwegian, Icelandic and Finnish programming air on SVT, while DR, NRK, YLE, KVF and RÚV show Swedish programmes. When there is major breaking news out of Denmark however, SVT may also source live coverage from TV2. Kaknästornet in Stockholm is the major broadcasting antenna for TV and radio. SVT1 – The main channel with broad and regional content. The 10 most seen Swedish TV shows in 2006 were shown on this channel. SVT1 HD simulcasts in high definition. SVT2 – A channel with slightly narrower programming with an emphasis on culture, current affairs and documentaries. SVT2 HD simulcasts in high definition. Barnkanalen (The Children's Channel) – Programs for children and (pre-)teens. Kunskapskanalen (The Knowledge Channel) – Broadcasting debates, seminars and documentaries in cooperation with UR. SVT24 – Reruns of programmes from SVT1 and SVT2 in the evening and continuous news updates during the night. Shares frequency with Barnkanalen. In addition to these channels, SVT has a special events channel called SVT Extra. It is generally unused and was (as of 2006) last used for live coverage during the 2004 Summer Olympic Games. In 2006, SVT launched a high-definition channel called SVT HD, simulcasting HD versions of programmes on the other SVT channels. All channels, except SVT1 HD and SVT2 HD, are available in most of Sweden through the digital terrestrial television network and encrypted from Thor and Sirius satellites. Until September 2005, both SVT1 and SVT2 were available nationwide via analogue terrestrial transmitters. Cable networks are required to broadcast four SVT channels for free in either digital or analogue form. SVT World, a mix of the SVT channels, is broadcast on satellite and worldwide via IPTV, and also as a terrestrial channel in Swedish-speaking areas of southern Finland. For rights reasons, SVT World does not show acquired material, such as movies, sport, or English language programming. SVT1, SVT2, Barnkanalen, SVT24, and Kunskapskanalen are also available through DTT on Åland and can be distributed on Finnish cable networks. In Ostrobothnia, Finland, SVT1, SVT2, SVTB and SVT24 are transmitted through DTT as pay TV to the Swedish-speaking population. The signals from the terrestrial transmitters in Sweden can be received in some areas of Denmark and Norway as well as in northernmost Finland near Sweden. With special equipment reception of Swedish terrestrial transmitters is possible even on some parts of the Finnish coast as well as the Polish and German coast closest to Sweden. Cable networks in the Nordic countries generally redistribute SVT1 and SVT2 often for an additional monthly subscription charge in addition to the subscriber's main package. Some Nordic hotels, especially in Denmark and Norway, also offer SVT1 or SVT2 to guests. SVT considers their website, svt.se, a channel in its own right. SVT also provides an on-demand service called SVT Play through which most of the programmes produced for SVT and air on its channels are available. However most non-news and non-current event programmes on SVT Play are only available for viewing in Sweden. The executive management of SVT is handled by a CEO, appointed by the board. The CEO of SVT is currently Hanna Stjärne who took over the role from Eva Hamilton in 2015. The Chairman of the Board is Lars Engqvist, deputy Prime Minister of the previous Social Democratic government. These four district areas produce networked output and co-ordinate ten of the eleven regional news services broadcast daily on SVT1. SVT Nyheter & Samhälle - national news, current affairs, documentaries and the regional news service ABC. SVT Fiktion - drama, entertainment, youth and children's programming. SVTi - multimedia and interactive services. Before Sveriges Television was formed in 1978, television broadcasting was controlled by channel controllers. Nils Erik Baehrentz was the controller between 1958-1968. He was succeeded by Håkan Unsgaard who became TV1's controller in 1968 and Örjan Wallquist who became the TV2 controller in 1969. When Sam Nilsson retired, the executive chair was split between a CEO and a Programme Officer. This position was abolished in 2007. A diagram showing the different shares of the viewing for the four major television companies in 2006. Since the arrival of commercial television, SVT's combined viewing share has declined steadily and digital channels have also provided competition. The commercial TV4 became the most watched station in 1995 and maintained its position until 2002, when SVT1 regained the status. TV4 became the most watched channel again 2006. The combined viewing share of the SVT channels declined from 50% in 1997 to 40% in 2005. However, SVT remains the most watched network in Sweden with a share of 38.3% in 2006, although all three major commercial channels attract a higher share of 15- to 24-year-olds than the two SVT channels combined. ^ a b "Ny avgift ersätter radio- och tv-avgiften – frågor och svar" [New fee replaces the radio and TV fee — questions and answers]. regeringen.se (in Swedish). Regeringskansliet. 2018-11-14. Retrieved 2018-11-25. ^ "Svårt med nya kanalnamn". Dagens Nyheter. 8 January 1996. ^ a b Hult, F.M. (2010). Swedish Television as a mechanism for language planning and policy. Language Problems and Language Planning, 34(2), 158-181. ^ "Utsändningar". Ålands radio/tv. Archived from the original on 2007-06-22. Retrieved 2007-07-29. ^ "Årsrapport 2006" (PDF). Mms.se. Wikimedia Commons has media related to Sveriges Television. This page was last edited on 29 March 2019, at 15:23 (UTC).